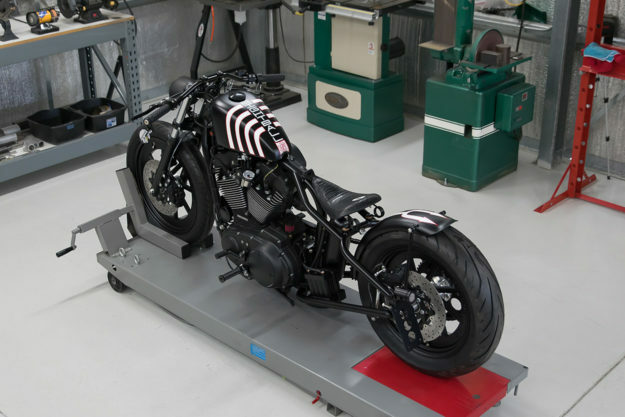 There’s more than one way to skin a cat; or, in moto terms, there’s more than one way to customize a Sportster. We’ve had all sorts of Harley-Davidsons grace these pages—from bobbers to cafe racers, scramblers and flat trackers. 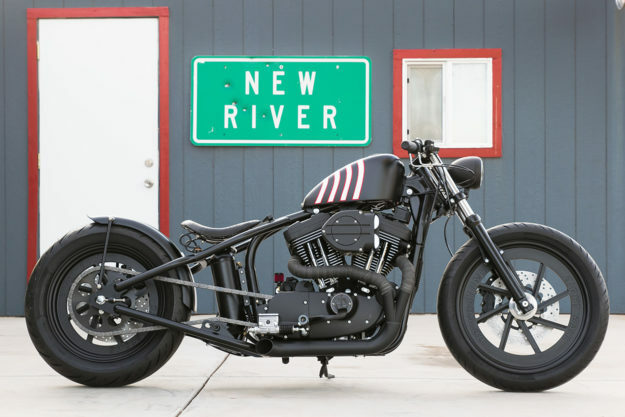 Which has us wondering: is there still room for low-slung, hard-tailed and stretched-out (read: uncomfortable) Sportsters in the custom scene? 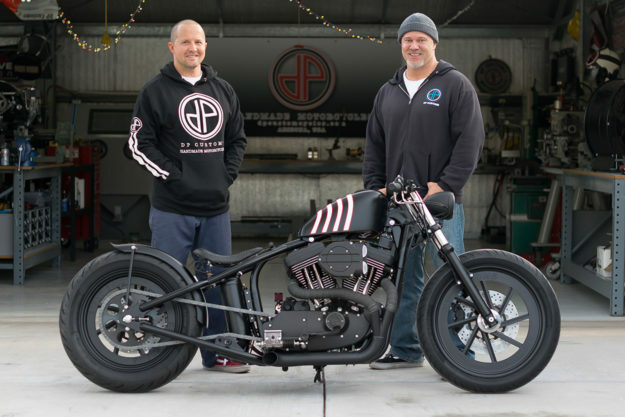 For the Del Prado brothers, the answer’s a solid ‘yes.’ Despite having built several bikes with full suspension and sound ergonomics, their phone still rings off the hook for the hotrod style that originally put DP Customs on the map. 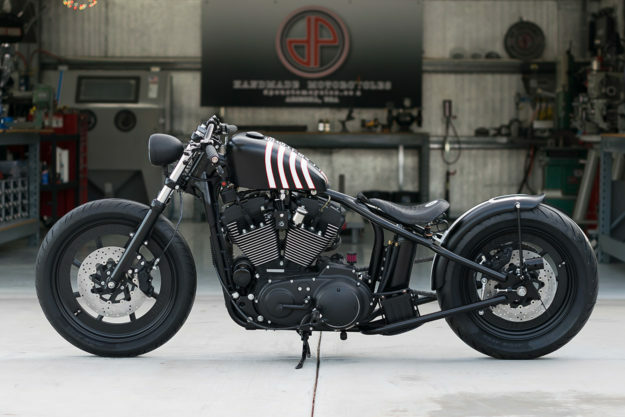 The brothers started with a 2001-model Harley-Davidson Sportster 1200, and gave the motor a complete tear down. It’s been treated to a couple of go-fast bits: a Dynatek single fire ignition, and a beefy looking intake from Kuryakyn. The intake—and a couple of other bits—have all been coated in black Cerakote. DP also rejetted the carb, and fabricated a new two-into-one exhaust. 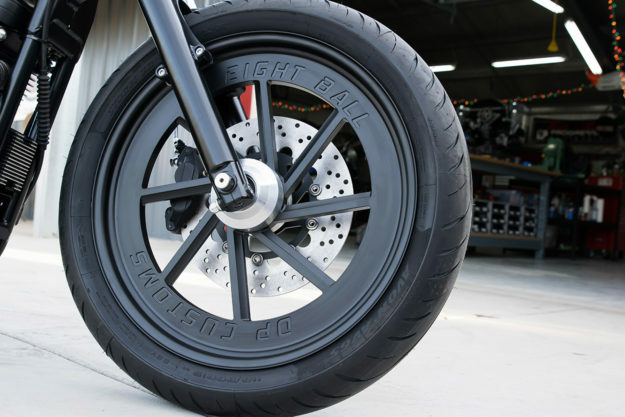 The Sportster’s been converted from belt to chain drive, with a hefty 51 tooth rear sprocket to make it quicker off the mark. And it’s now carrying a much lighter Lithium-ion battery from Ballistic. As per the client’s request, a rigid rear end was fabricated with a 4″ drop and a 6″ stretch, and DP also swapped out the wheels to get the stance just right. 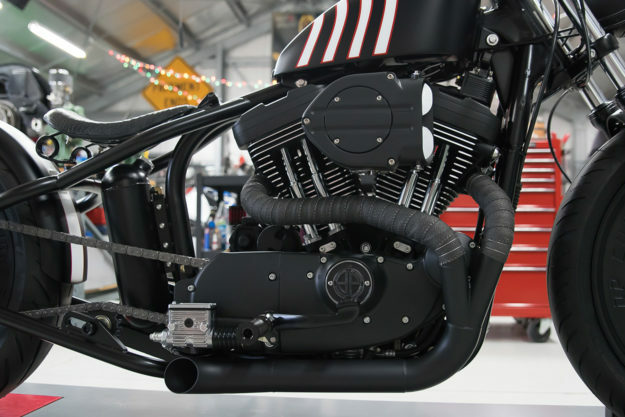 The bike’s now riding on a 19F/17R combo, designed by the Del Prados and machined by Thomason Performance. 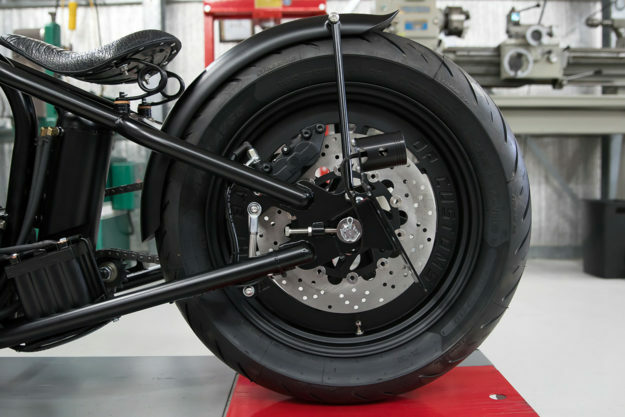 “We got the idea for the twisted style spokes on the wheels from Honda’s MotoGP bike, and then added the lip for a stockier more blacked out look.” They’re sporting custom-made matching brake rotors too, with Brembo calipers. 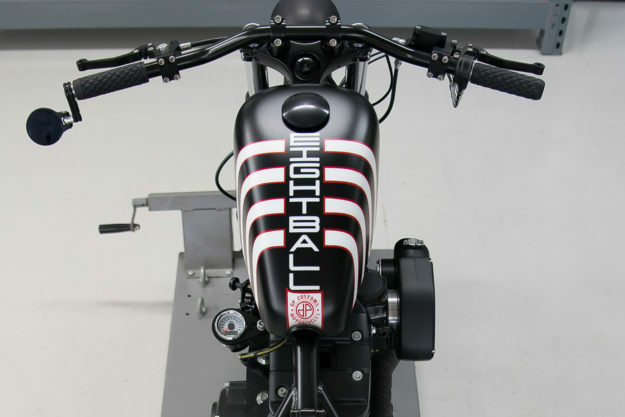 The fuel tank’s a Harley peanut unit, and the oil tank is from Chassis Design Co. The seat’s a Biltwell item—hand-covered in ‘real ‘gator’ by Unique Upholstery. A classic, duck-tailed fender finishes off the rear. The cockpit is extremely minimal, featuring nothing more than a set of flipped tracker bars, Biltwell grips and ISR controls. The ignition—and a small combination tacho-speedo—now sits to the left of the engine. 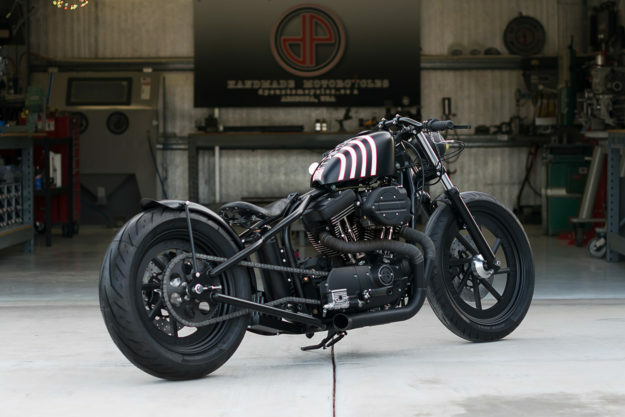 The Sportster probably has a switch or two, but we have no idea where DP hid them. Frequent collaborators Walkers Way were responsible for the paint; a mostly murdered-out affair, with splashes of white and red. And with that, ‘Eight Ball’ was ready to terrorize the peaceful streets of Carefree. Yes, but you actually had us at “Real ‘gator,” guys.